What does it mean when an airline takes out a $600 million loan, secured by its own jets? In normal times, such a move would be a red flag, a sign that the borrower might be in trouble and need a financial lifeline to keep afloat. But these are hardly normal times for the airline industry. In recent weeks, [% 2541752 | | Aloha %], [% 2544741 | | ATA %], [% 2556964 | | Eos %], and [% 2546182 | | Skybus %] have shut down completely. [% 2549144 | | Frontier %] is operating under protection of Chapter 11 bankruptcy. And the legacy airlines are [% 2557196 | | scrambling to merge or form strategic alliances %] to cushion themselves against the corrosive duo of soaring fuel costs and softening demand for air travel. Against that grim backdrop, a substantial loan would be enough to place most airlines on industry observers’ death watch. 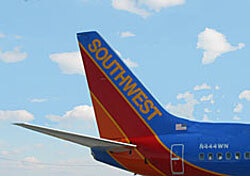 But the airline on the receiving end of that $600 million loan is none other than Southwest. With an unmatched record of 17 years of continuous profitability, no one doubts that Southwest will weather this storm. So why the loan? In the 50-plus pages of its Form 8-K, submitted to the Securities and Exchange Commission on May 6, Southwest is mum on the rationale for the loan. But the reason isn’t far to seek. As it did so successfully with fuel futures, Southwest is hedging against what it expects to be continued challenges to its profitability. And unlike many of its fellow airlines, which are on shaky financial ground, Southwest is financially sound and thus able to secure a loan on favorable terms. This is a case of the strong taking advantage of an opportunity to leverage its strength. While the loan doesn’t reflect negatively on Southwest itself, it is cause for concern about the industry overall. Southwest’s success gives it credibility, and if the airline’s planners are anticipating a prolonged slump, there’s a good chance that’s exactly what we’re in for. If so, as I’ve warned in [% 2544840 | | a previous blog post %], consumers will have to be extra vigilant in monitoring the financial health of the marginal airlines, lest they find themselves holding tickets on grounded carriers and miles in defunct loyalty schemes. Thanks, Southwest, for the heads up.